Our hexagonal perforated metal mesh provides an extremely high open area of up to 85%. Sheets with holes of this configuration are very lightweight. The stability of the parent material is of the utmost importance to maintain the shape of a honeycomb structure. This pattern produces an appealing, timeless design suitable for current and future product applications. 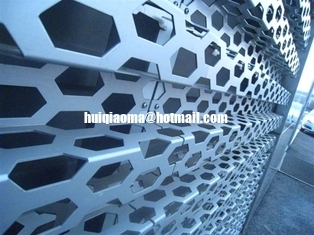 Hexagonal perforated metal mesh has maximum ventilation. The need for effective cooling is increasing for many technical products. Flexible solutions and innovative products like our hexagonal perforated metal mesh is the answer. Our hexagonal perforated metal mesh provides an extremely high open area of up to 85%. Sheets with holes of this configuration are very lightweight. The stability of the parent material is of the utmost importance to maintain the shape of a honeycomb structure. This pattern produces an appealing, timeless design suitable for current and future product applications. The ability to control airflow can be used not only for cooling, but also the opposite effect using a targeted heat supply. Material: Stainless steel sheet, carbon steel sheet, aluminum sheet, galvanized sheet, copper sheet, PVC sheet, etc. Specification & Size: Customization, metal sheet thickness 0.1mm-15mm; metal rolled sheet thickness 0.2mm-1.5mm; maximum width 1,250mm. Hole diameter, center distance: Metal sheet 0.1mm-200mm, metal rolled sheet 0.5mm-10mm, center distance specified by customer or recommended by us. 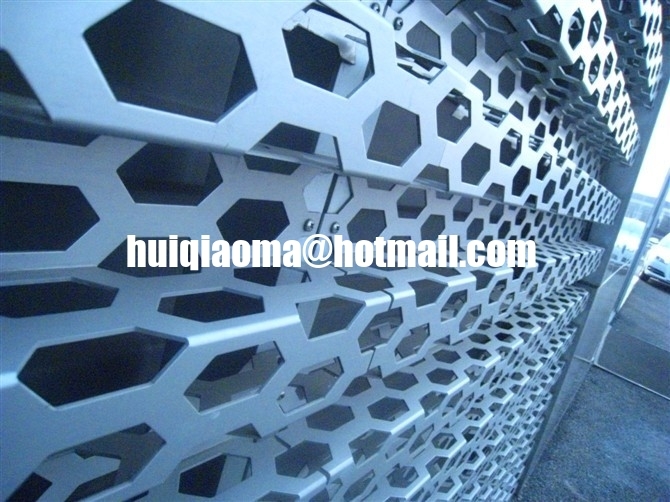 Hexagonal perforated metal mesh for IT application Whether it is racks or server cabinets the heat developed from the integrated systems and components must be removed to the outside efficiently, which is usually achieved by using internal fan modules. A sheet with a hexagonal perforated mesh provides a very large open area giving optimal ventilation. Thanks to the high air flow, temperatures can be kept constant in the cabinet, whereas the other areas of the cabinet can remain obscured by non-perforated areas and are therefore protected. Hexagonal perforated metal mesh for automotive application The need to cool heat producing parts of machines and engines e.g. tractors and other vehicles is a traditional application for perforated sheet metal products. Depending on the chosen open area, the heat can either be dissipated or be re-circulated. Small hexagon perforated metal mesh can also be used as protection against insects in the engine compartment.